Some reckon there is just one way to run the world. That singular path is the set of ideals surrounding liberal democracy and market capitalism, as practised in the countries surrounding the TransAtlantic Axis. The political scientist Francis Fukuyama describes such a mode of governance as “the only coherent political aspiration that spans different regions and cultures around the globe” and the “endpoint of humanity’s ideological evolution”. That system is, in this view, “the only plausible solution to the fundamental problems of human history”. Moreover, the solution is constructive: Simply unleash the forces of economic creative destruction and all manner of individual freedoms: the result will emerge, by some fundamental theorem of human engagement, as a social outcome good for all. Deviations from that one path include Singapore’s variant of so-called “authoritarian capitalism” or China’s still-evolving brand of state capitalism. These emphasise public-good interventions led by large state entities: those public goods might take the very concrete form of highways and railroads and bridges, or (more objectionable for some) more abstract forms of political order and economic stability. Those large state entities might be the state itself or government-linked agencies such as sovereign wealth funds or national development banks. The model of one pathway to success might well be the right model. Its supporters argue that history has been unrelentingly unkind to those who have deviated: “while earlier forms of government were characterized by grave defects and irrationalities that led to their eventual collapse, liberal democracy was arguably free from such fundamental internal contradictions”. Indeed, in Fukuyama’s powerful prose, “we cannot picture to ourselves a world that is essentially different from the present one, and at the same time better. Other, less reflective ages also thought of themselves as the best, but we arrive at this conclusion exhausted, as it were, from the pursuit of alternatives we felt had to be better than liberal democracy”. China’s development model is different from the one currently fashionable in the West. It is based on massive state-led investments in infrastructure — roads, ports, electricity, railways, and airports — that facilitate industrial development. American economists abjure this build-it-and-they-will-come path. But there are of course other instances where one mode of governance finds awkward that alternatives might succeed. Tyrion Lannister recognized how short-lived the coalition would be that he’d built with the slave Masters for the newly-liberated city of Meereen. The Masters cannot let Meereen succeed. Because if Meereen succeeds, a city without slavery, a city without Masters, it proves that no one needs a Master. 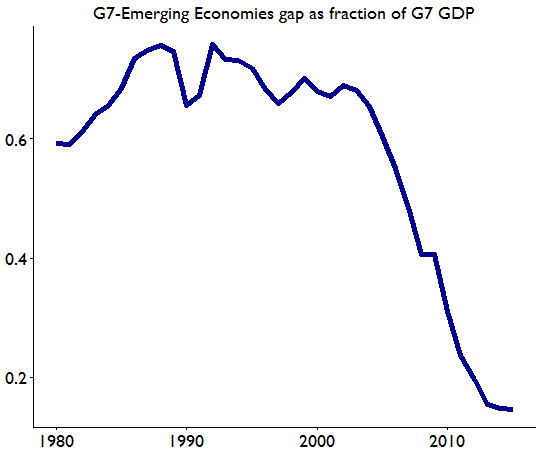 First, throughout the 1990s and into the early 2000s, the collection of a hundred or so emerging economies in the world had combined GDP only 35% that of the G7. By 2016, however, that poorer group of economies reached, in essence, parity with the G7. 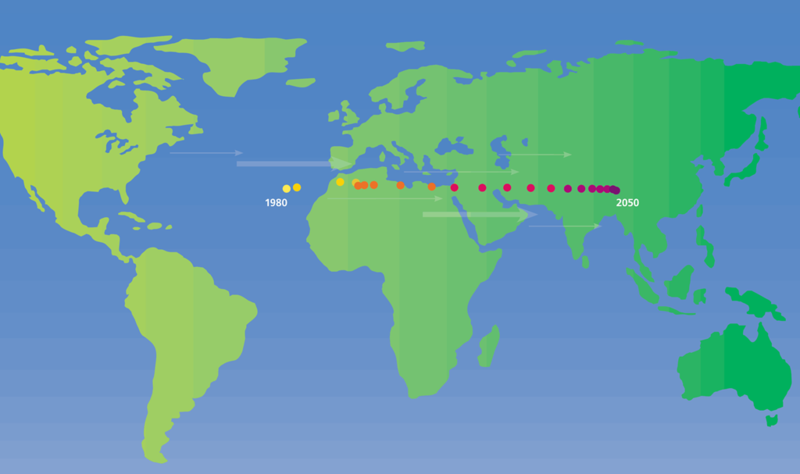 Second, the world’s economic centre of gravity sat on the TransAtlantic Axis in the decades running up through the 1980s, accurately reflecting how the global economy was primarily just the US and Western Europe. In the last 35 years, however, that centre has been propelled 5,000 km across the surface of our planet, driven east by the rise of China and other Asian economies. 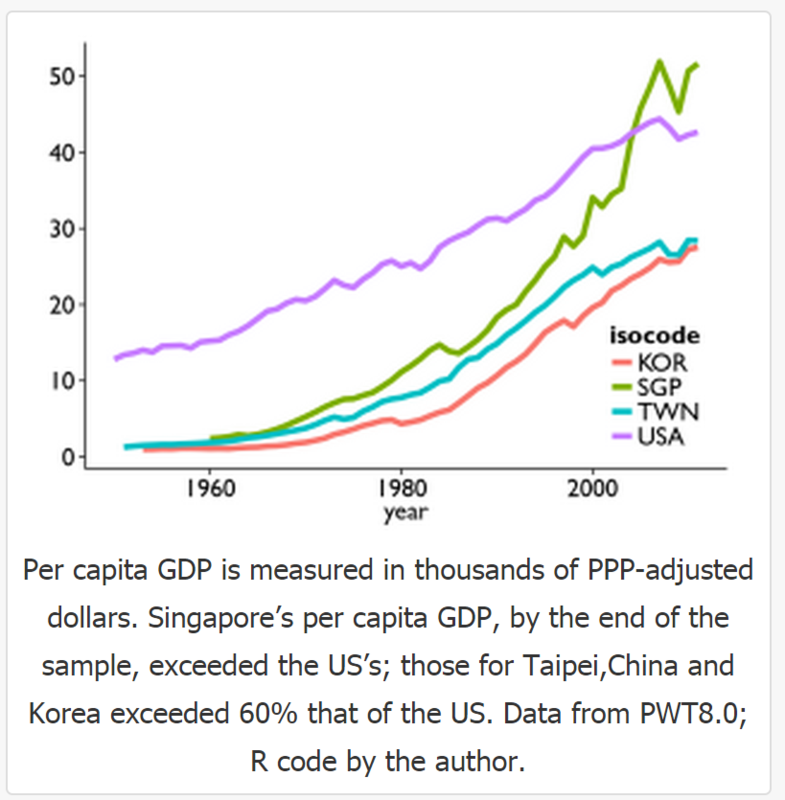 Third, in the 1960s East Asia’s economies — Singapore, Taiwan, Korea — had per capita GDP an insignificant fraction those in the developed West. Singapore, in particular, was singled out for how its development model of high savings, hard work, large investment led to abysmally low levels of productivity growth and was, therefore, on an unsustainable trajectory. That trajectory might indeed still be revealed to be unsustainable. However, by 2005, Singapore’s per capita GDP had overtaken that of the US, and by all accounts the Singapore-US gap continues to increase. Fourth, there are many ways in which you can separate out half the world’s population, to locate a simple democratic majority. But if you want the smallest geographical area that contains half the world’s population, that’s a 3300km-radius circle centered on Eastern Myanmar. 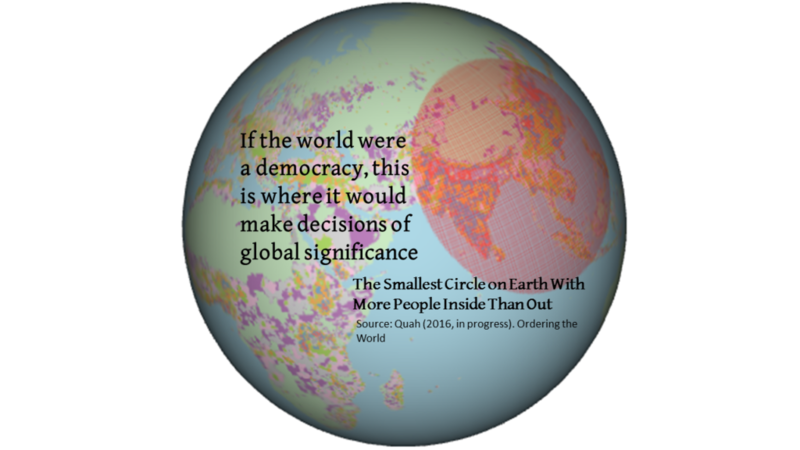 And unless you think ordinary people, given their circumstances, should be disenfranchised from global decision-making, it is here that the world ought to be making decisions of global significance. To be clear, this post does not seek to argue that political repression and state control might the right options for many. Far from it. If liberal democracy and market capitalism are not the only means to success, it does not follow that their opposite is. But this post does point out that the large empirical evidence for now fails to support the idea that there should be just one way to run the world. Obviously, all the trends I point out in the large-scale evidence might be soon reversed. Alternatively, however, they might accelerate. Be that as it may, in a situation of uncertainty, option value rests in having alternatives: Multiple pathways to economic success ought to be pragmatically considered. The way forwards is not unique. Without free riding on Western developed technology neither China nor Singapore would be where they are. Sorry, what you write is just justification for repression. When net migration is from the US to China and not the other way around, your argument would have a leg to stand on. People vote with their legs.